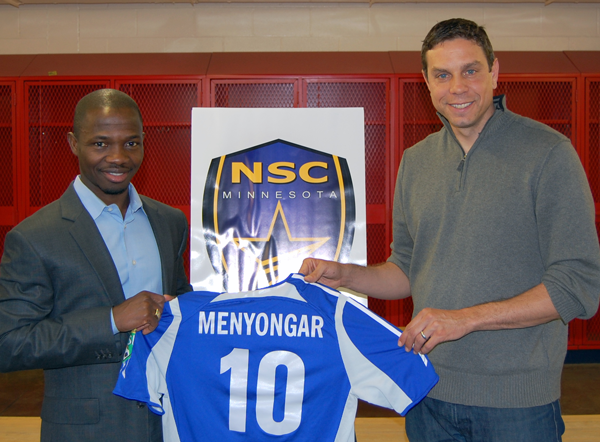 The NSC Stars announced today the signing of Johnny Menyongar as the first player for the new soccer franchise. Menyongar, a Liberian native and resident of the Twin Cities is no stranger to Minnesota soccer fans. Menyongar played for the Minnesota Thunder from 2000-2005 and was a fan favorite being nicknamed the “Tiny Ticket”. He was known for his close control of the ball and turning innocuous situations into goals. In Menyongar’s time with the Thunder he scored 56 goals in 188 appearances. He was also a big contributor to the Thunder’s Lamar Hunt US Open Cup run in 2005 where he scored 5 goals in the competition, three of them coming in an away win against the Kansas City Wizards. 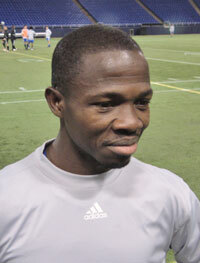 Menyongar has played for the Rochester Rhinos the last 4 seasons and scored 28 goals in 106 appearances. He was also named the team’s MVP in 2008 and 2009. One of the most effective offensive players in the league, Menyongar finished 2nd in goal scoring and 4th in points in the USL last season. If not for a season-ending ACL injury late in the season, he most likely would have been USL MVP. The signing of Menyongar to a 1-year contract is a good one to start the team off. It gives the team a veteran of Division II soccer and adds excitement to the team. Something the former Thunder team had missed since losing Stephen Deroux to Montreal last season. Menyongar has been working hard at his rehab from his ACL replacement surgery and according to his agent he will be ready to play come the opener on April 10th.